Now, I’ll admit that a little of that has to do with personal pride. But fundamentally, it’s because asking for help means I can’t do something on my own. It means that I don’t have it all together. It means that I might disappoint someone because I need help. It reveals a weakness. Weakness. The word alone makes me cringe. These are the words that run through my mind when I think about what it means to be weak. We have been trained to think this way. To think that weakness is a problem, a shortcoming. To a large extent, it does make sense to think this way, seeing as how weakness means being weak. Weak: “having little physical power or ability, not strong; having little power or force; likely to break or stop working properly, not able to handle weight, pressure, or strain” (1). It’s no wonder that the thought of being weak scares me. It means that I am incapable of doing something the right way, if at all! It’s terrifying to admit that I am not and cannot be perfect. That I don’t have it all together. That I don’t have all the answers. That I might not be everything I am expected to be. Well here’s a newsflash: I don’t have to have it all together. Yes, asking for help may reveal a weakness. And yes, weaknesses reveal shortcomings. They show the world that we don’t have our lives figured out, and that we aren’t able to handle everything on our own. But there is strength that comes with admitting weakness. When we ask for help, we allow another person to fill a need. We allow them to showcase a strength of theirs while we grow in humility. In turn, we are strengthened in humility and virtue. 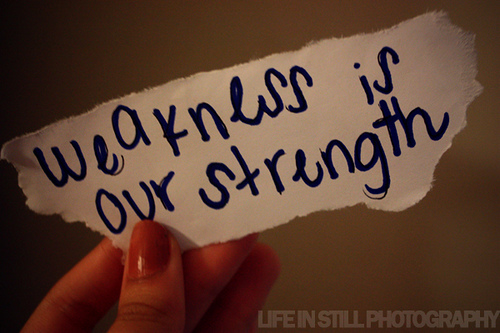 Weakness is universal. No one is perfect. No one can do it on their own. And by “it” I mean live a healthy, happy life. We need community, and we need to share in one another’s triumphs and failures. Through this, we are able to help each other to grow, to learn from our mistakes and successes. As a senior in college, I’m facing a time filled with excitement. But it’s also one filled with uncertainty. I have to intentionally decide what I want to pursue, where I want to go, and who I want to be around. And, quite frankly, I don’t have a definite answer to any of these yet. I am working on it, but some of it I can’t do on my own. Sure I can make decisions about who I will try to maintain contact with, who I will live near, and the general area I want to live in. But, as is the case with most college graduates, I’m not sure what exactly I want to do and, when I do decide, how to get there. One thing that is stressed over and over again is the need to network, network, network. What a humbling experience. Sure it can be easy enough to meet people and make those initial contacts, but at a certain point you are supposed to put those contacts to use. Which means asking for other connections, asking for recommendations, asking for help. Every time someone asks “What are your plans after graduation?” I tend to cringe a bit. I don’t have it all together, at least not yet. And there is a lot of asking for help that has to happen before I get there. But I suppose I’m not in such a bad spot. After all, “to be conscious of one’s weakness and to trust in God’s help is the way to authentic strength and victory” (2). I’ve realized that I don’t have it all together, and that’s okay. But I do need to ask for help more often. Only by doing this will I be able to grow from these challenges and keep my weaknesses from holding me back. You are allowed to have weaknesses, and it’s okay to admit them. And that’s that. Put aside your pride and admit that you are human, that you don’t have it all together. Be honest with yourself. You don’t. And when you need help, just ask. Someone is waiting to help you. Alice von Hildebrand, The Privilege of Being a Woman, 42.